Growing up in the West Indies we always had pets. We had dogs, cats, birds, fish, lizards, snakes, and turtles. We were a pet loving family. When my wife and I were first married I had several fish tanks with Discus and freshwater Angelfish. Both are from the South American Cichlidae family. I love Cichlids. I think they are among the most intelligent fish. The tanks — I had two — were set up with high volume biological filters and live plants. I lost both tanks — lingo for all the fish died — while on a weekend vacation. Despite my explicit instructions on overfeeding, the person I left to care for my tanks couldn’t resist. “They looked so hungry”. Sigh. My daughter has had some recent traumatic experience with pets of her own so we were pet free until recently. Then we bought a fish. 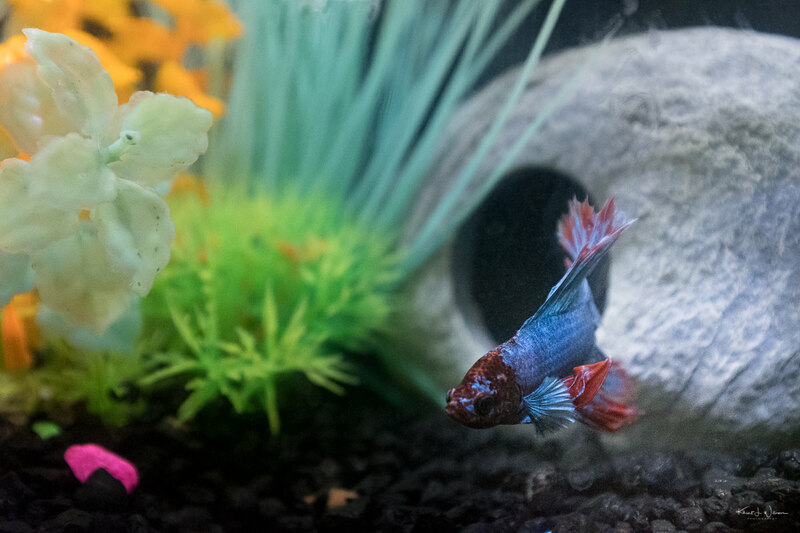 A Betta splendens that she has named, Electric Boogaloo. I think Boogie is good therapy for her. She fusses over him, making sure his water is clean, that he only eat what’s needed, and get the right amount of light. It is challenging to take photos of a fish. Especially through the glass. The auto-focus worked against me.